ON A WALK around a protected marsh area late last summer, I came upon a young acquaintance named Corby, who stood on a knoll scanning the horizon for migratory birds. For most of his life, Corby - with his parents’ encouragement - has wandered the hills and riverscape surrounding his family’s farm, honing his skills as a keen observer of nature. He’s attended outings with birders and dog-eared many a field guide. At age 12, his curiosity and ability to focus in on the subtle comings and goings of wildlife has earned him the respect of much older and experienced field naturalists. That day he was struggling to distinguish between the sound of a woodcock and that of a snipe. According to any number of studies released over the past decade, Corby’s entrancement with nature may benefit him in more ways than imagined. Some studies suggest that direct exposure to the natural world can reduce hyperactivity, lessen stress and heighten children’s creativity and concentration. Above all, the researchers say, it increases their joy in life. Those same studies also reveal that images of children ensconced in nature exploration are beginning to look like snapshots from another era. Contrast Corby with the fourth grader in Richard Louv’s book Last Child in the Woods (Algonquin Books of Chapel Hill, 2005), when he says, “I like to play indoors better ‘cause that’s where all the electrical outlets are,” and you get a sense of an unprecedented change. Louv, a child advocate and journalist, coined the phrase “nature-deficit disorder” to describe children’s fixation on computer and television entertainment rather than on natural wonders. It stands to reason that if children become alienated from nature, they are unlikely to protect it. Louv said as much when he pointed out that environmentalism is a value that springs from an early and profound childhood experience in nature. While some children can speak know-ledgeably about the environment - the disappearing rain forest and the havoc caused by tsunamis - many have little first-hand acquaintance with the flora and fauna outside their doors. Nature has become an abstraction, the stuff of National Geographic specials rather than daily life. And as Louv and other observers are pointing out, this disconnection threatens the well being of the entire planet. Fortunately this groundswell of attention on the diminishing levels of children’s interest in the environment is gaining momentum and impelling parents, educators and others who work with young people to seek out the many excellent tools designed to help reverse the trend. At the top of the list of must reads is an important report released last fall by the National Environmental Education & Training Foundation (NEETF), called “Environmental Literacy in America,” which draws from dozens of studies on the child/nature split and examines a number of successful environmental literary programs in the United States to counteract this divide. The report, conducted in partnership with Roper Public Affairs, offers recommendations to provide young people with a wider and stronger base of environmental knowledge and change the way they feel and behave toward the environment. To instill a long-lasting stewardship ethic, students need more than just a yearly trip to a nature center, writes Kevin Coyle, the author of the report. While courses in environment topics are popular electives, little is delivered in way of definitions and principles or environmental science and systems. Unless students grasp basic concepts and understand how one event can precipitate another, their comprehension of more complicated topics needed to affect change will be limited. Take the usage of the term “non-point source pollution.” The term grew out of the vernacular from the U.S. Clean Water Act as a way to contrast specific types or “point” sources of pollution (the outflow of water from a treatment plant), with run-off from the land (non-point). The term is commonly tossed into mainstream news articles with the assumption that most readers understand how rainwater causes motor oil, pesticides, sewage and other pollutants to “run off” into lakes, rivers, streams and bays. It is in fact, the most common form of water pollution, according to the U.S. Environmental Protection Agency. Yet the report mentions a study by National Geographic in 2000 that found only 14 percent of the public is even familiar with the term. This brings us to why broad-based, comprehensive environmental literacy programs are critical if we are to deal with the increasingly complicated environmental issues we are facing now and in the future. The report devotes an entire chapter to the designing of a successful environmental literacy education program. From the earliest grades on, Coyle recommends a curriculum that emphasizes investigation and problem-solving to grasp more complex interrelationships, say, how a watershed functions. As part of this model, he stresses any number of outdoor learning programs from schoolyard gardening to wilderness experiences to help children develop affection for and identification with nature so they see themselves as an integral and responsible member of the ecological community. Another mention is the so-called “place-based education” model that connects students with the larger community, through beach clean-ups, water quality monitoring or other work with conservation or community service organizations. Surely it takes time and diligence to inculcate environmental stewardship values into the general populace, or as Coyle writes, “True environmental literacy…cannot be placed in an educational microwave.” But the momentum is clearly there, and so are the educational tools. What’s needed is the will to make true environmental literacy an educational priority. Here in our own region there are many good examples of solid environmental education programs from which to draw. The Dr. Arthur Hines Elementary School in Summerville, Nova Scotia teaches the ecology of mudflats, tides and the workings of a restored salt marsh by placing students in the natural surroundings throughout their grade school experience. Students at Sackville High School in Sackville, New Brunswick study wetland ecology through the adjoining Wetland Education Centre and constructed wetland on the school grounds. 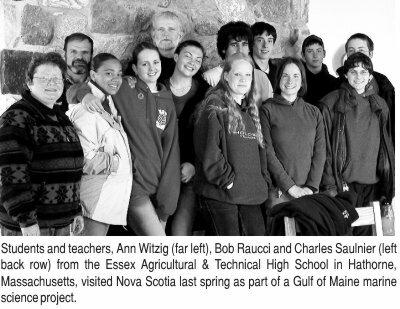 The Essex Agriculture & Technical High School’s Environmental Sciences in Hathorne, Massachusetts offers a multi-level curriculum where each year students travel to Nova Scotia to study the similarities and differences of marine cultures in the Gulf of Maine. For other recommended programs in the region contact the Gulf of Maine Marine Education Association at www.gommea.org. See also additional listings on marine education and environmental literacy in the Resource section on Page 11. “Environmental Literacy in America” is available in PDF format at the National Environmental Education & Training Foundation’s Web site, www.NEETF.org. The Foundation also sponsors a gateway site for K to 12 educators and projects for home-school, after school and informal education at www.ClassroomEarth.org. This is just to say that I really enjoyed Ethan Nedeau's article in your winter 2005 edition of the Gulf of Maine Times. As one who had been involved in the listing of the dwarf wedgemussel as extirpated under Canada's Species at Risk Act, I have felt the same optimism and frustration that Mr. Nedeau expresses but he clearly has much more tangible experience. I might add that there is a fair amount of recent work on endangered Atlantic salmon populations in the inner Bay of Fundy and there is a feeling that these populations likely lived on Georges Bank and or on adjacent banks or islands at some time in the glacial period. Indeed, it is hypothesized that this is why these salmon apparently don't migrate to Greenland (like all other salmon populations). The fact that inner Bay salmon populations are now on the verge of extirpation and have already been extirpated from the Petitcodiac does seem to link well with the extirpation of the dwarf wedgemussel in that river system. Indeed, the Petitcodiac salmon population used to be in the thousands and there is conjecture that that population was the "mother population" for other inner Bay populations and that the demise of the Petitcodiac population led to the demise of the others. If that salmon population had that kind of influence on other salmon populations, perhaps it's not a stretch to suggest that its demise also led to the extirpation of the mussel as well in other inner Bay of Fundy rivers.